Pilla 2000 was founded in 2000 so we are until 11 years on the valve’s market. We are manufacturer of valves and valve’s distributor. We have very big stock from actuated valves and actuators so we are proud that lot of Hungarian and Central European customers take the phone up when they need actuated valves. Our best products are butterfly valves, stainless steel ball valves, pneumatic and electric actuators, spill valves, pressure reducers, solenoid valves, seat valves, knife gate and gate valves, pinch valves. We are the TAKASAGO Electric INC. distributor in Hungary. Pilla 2000 have working together with TAKASAGO ELECTRIC INC. from 2001. We think this is very big honor to represent this Japan technology in the Hungarian market. We offer clean valves, pumps, syringes, manifolds and chips to the labor instruments, analyzers and other places where are important the small, high quality. WHY YOU CHOOSE THE PILLA2000? 1/ We have 2 engineers who have very big experiences in the valve market. You will get not only valves, you will get technical help to choose the good valves to the good place. 2/ We have competitive and cheap prices but we keep the good quality and wouldn’t like to reduce the material quality. For example you will not buy butterfly valves with capillary thin GGG disc, you will not buy AISI304, AISI201 valves with AISI316 mark. We sell electric actuators with IP67 protection that you can build in outside too. 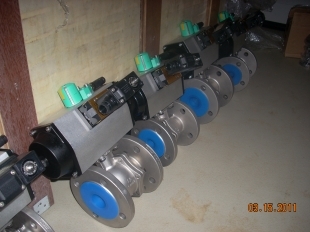 3/ We sell the valves from stock that you can get the valves very urgent. For example we keep the butterfly valves to DN600, the stainless steel ball valves to DN100, the pneumatic actutors to DA270 and SR270, the electric actuator to 500 Nm. 4/ We sell the valves to whole EU. If your order higher than 5000 EUR than we would send the package to all EU country free of charge. You can pay on 30-60 days after some businesses.